Communication between users in shared editors takes place in a deprived environment — distributed users find it difficult to communicate. While many solutions to the problems this causes have been suggested this paper presents a novel one. 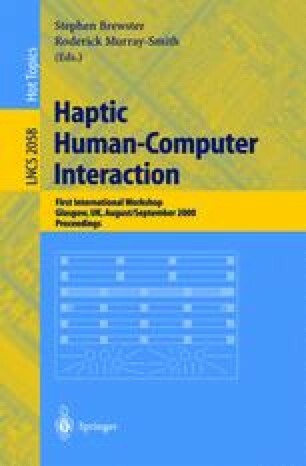 It describes one possible use of haptics as a channel for communication between users. User’s telepointers are considered as haptic avatars and interactions such as haptically pushing and pulling each other are afforded. The use of homing forces to locate other users is also discussed, as is a proximity sensation based on viscosity. Evaluation of this system is currently underway. This research was supported under EPSRC project GR/L79212 and EPSRC studentship 98700418. Thanks must also go to the SHEFC REVELATION Project, SensAble Technologies and Virtual Presence Ltd.